Public transport fare changes next year – will they have unintended consequences? Most years there’s a public transport price rise. This year it’s a little more complicated – a number of other changes have been announced. The Budget Update delivered on Friday included some tweaks to the fare system. But they may have an unintended effect on patronage. A number of changes will be made to public transport fares to ensure continued improvements in service delivery. These include the following. Public transport fares will increase by CPI plus 2.5 per cent from 2015 to 2018, contributing to ongoing investment in the network. The rise for 2014 is just CPI, which ABS figures show is 2.2%. Four CPI plus 2.5 per cent rises in a row means an overall increase of (if my maths is correct) 10.4% in real terms, following CPI plus five per cent rises in 2012 and 2013, originally planned by Labor, but kept by the Coalition. These new rises will chip away about half of the discount everybody got when forced off single Metcard tickets onto the (bulk price) Myki fares, and will put a zone 1 two-hour full fare (the standard fare for most tram trips, of any distance, even just a couple of stops) up at over $4. The full price list for 2014 is here. Notable is that the zone 1+2 two hour fare (the “default fare” for metropolitan trains) in 2014 will be $6.06, which is slightly over the $6 cost of a Myki card — assuming this doesn’t rise (it hasn’t been mentioned). This means that for the first time, if you have under 6 cents on your card, it’s cheaper to make a two-zone trip, throw the card away and buy a new one. Not that that’s using the system as intended. Few people would regularly get a balance of such a small amount, and one would hope not many would go through that inconvenience for the sake of a few cents. The public transport weekend daily fare cap will be adjusted to $6 from 1 January 2014. The current weekend daily cap on all metropolitan public transport travel provides a significant discount to weekend travel compared to the daily weekday fare. An increase to the daily weekend cap to $6 for Zone 1 and 2 travel will better align weekend and weekday fares while still providing value for weekend travellers. This is a big jump from $3.50 to $6. There is no separate concession cap; it’s the same $6. That means there’s almost no discount at all for concession travellers who are not using Seniors fares, as the maximum normal fare for them is $6.06. Ditto for zone 1-only full fare travellers, about a dollar’s discount if they travel all day. The Weekend Saver daily cap (which also applies on public holidays), originally introduced at $2.50 on Sundays only, has been cited as a big factor in increasing weekend patronage. It will have an interesting effect on event crowds. For those going to big events (for instance the Showgrounds, football or cricket) on the weekend, the current $3.50 weekend cap effectively means you get a full day’s travel for the price of one trip. Thus currently the price of a trip to the game pays for the trip home as well. This means that if due to crowds you can’t touch-off on the way to the game, or can’t touch-on again on the way home, you’ve paid your way (though the legalities are unclear), and you also are prevented inadvertently paying more than you should. With a higher cap, a zone 1 traveller arriving at the game who touches-off will be charged the $3.58 one way fare. If they can’t touch-on travelling home, they’ve inadvertently fare evaded. A Zone 1 concession traveller will want to make sure they touch-off and on correctly, or they may end up paying more than necessary. Will the authorities try harder (eg install more gates and readers) to get passengers to touch-on and off at major events? It remains to be seen. The Richmond station exit to AAMI Park and the tennis centre, for instance, has very few Myki readers, and last time we were at the Showgrounds (for PAX), barely any were available. This is a removal of a benefit going back to the pre-Metcard paper ticket days, when paper periodical tickets were valid in any zone on weekends (and you could bring your family along for free as well), as a way of encouraging use of the system when spare capacity was available, and rewarding the public transport system’s most loyal customers. Note that due to the pricing, this zone benefit has already disappeared for concession and zone 2-only users. Removing most of the discount for weekend/public holiday zone 1 and concession users has the effect of making Passes (which are for consecutive days, and thus include weekends) more cost-effective for passengers who regularly travel more than four days a week. Two hour fares will expire exactly two hours after touch on from 1 July 2014. Currently, two hour public transport fares expire two hours from the start of the next full hour. The fare change reduces complexity and is easier to administer than rounding to the start of the next full hour. “easier to administer”? This sounds highly unlikely given the software has handled it fine since 2009, possibly earlier. Will it mean touch times are a millisecond or two faster? Given the expiry time was originally whole hours because of limitations with paper tickets, it’s not entirely surprising that they’d do this. Arguably it’s easier to understand. Will it mean some people wait at the station outside the paid area and all rush to touch-on just as the train arrives? Who knows. Can you remember that your fare expires at 3:41pm exactly? Since no useful information is provided on the card itself, it’d be nice if the reader software was modified to display it, but I wouldn’t count on it. Expiry applies to touch-on. It’s important to note that if a fare expires while you’re travelling, you don’t incur another fare if you touch-off at the end of your trip after the expiry time. It’s only the touch-on that needs to be before the expiry to avoid paying another fare. It also won’t effect you’re trying to finish your trip and your train is late, as long as you touched-on before the expiry time. But it will have an effect on people who want to watch their pennies and do short two-way trips, perhaps down to the shops or doctor and so on. It’s worth noting that once upon a time, all zones had three hour fares, in other words between 3:00 hours and 3:59. This was switched back to two hours in 1993. The after 6pm benefit?. At present fares that start after 6pm last until 3am. At this stage it’s not clear if this is staying. The PTV web site mentions it only in the context of paper tickets used in regional towns. Update 8/8/2014 — This is confirmed as staying. Rumours flying around suggested the Earlybird fare (free train rides before 7am on weekdays) was to have been scrapped from January 2014. That’ll be one to watch, as if it happens, it could have a big effect on peak hour train demand. It’s difficult to see where they’re coming from with the changes for 2014, other than they seem to be aiming to try to increase revenue and improve cost recovery. But is increasing prices the only way to do that? And does it risk reducing patronage, and end up not actually increasing revenue? In recent years with very cheap weekend caps and other initiatives, there was clearly an aim to increase patronage, particularly at times when there was spare capacity on the system. Perhaps it was “too successful”, with weekend train crowding triggering ten minute services on the busiest lines. But isn’t that a good situation to be in? More people travelling more efficiently on public transport instead of driving, leading to more services (read: better use of our substantial infrastructure), leading to more passengers? Perhaps $3.50 was too cheap, but it did mean that taking a family group out on the weekend (another benefit previously given to periodical holders) was cost-competitive with driving. A more saleable plan would have been to bump it to say $4.50, then have it creep up, accompanied by well-publicised service upgrades, for instance more lines going to every ten minutes. And the two hour thing? Well that’ll have little effect on 9-5 commuters, but may hit the less well-off hardest. Overall it remains to be seen what effect this package of changes will have on patronage, particularly on weekends. And it’ll be interesting to see what Labor says about all this. Will they reverse any of this? So far they seem to be non-committal. Update 26/3/2014: Two-zone fares to be capped to one zone; free tram rides in CBD. ← Previous Previous post: Train window ads – what about visibility? I’ve heard people claiming they will fare evade due to price rises. If you touch on more than once getting different trams it keeps charging you, so annoying. I had to keep getting recharges when I got my Myki replaced and did not want to put a pass on too long. I predict it will have an impact on weekend travel. The supposed bell-weather of ‘a family for four attending the football on the weekend’ will see fares rise from $14 to $24. It won’t take much for some to shift that $10 increase to parking and motorway tolls (if applicable) and drive the full distance, given that most drivers don’t calculate the true cost of additional mileage. Factor in the reduction in service frequencies of an evening, and it’s a sad state of affairs. Such a big increase in the weekend cap should have been used to split the concession and full fare weekend caps. The concession cap should have been left where it was or even lowered slightly (concession myki fares are half those of full fare, so it should have been made $3). An unintended consequence of the 2 hour rounding is that for people trying to make a trip both ways in the same 2 hours, they now have an incentive to touch on as the train arrives, so their 2 hours finishes at the latest point possible, and this could crowd station entrances. Previously the incentive was only to touch on after the change of hours. I agree with much of what Daniel said above. The time start on the hour is a legacy of the old paper tickets before Metcard. I often wonder why they never adjusted their policy back when we had Metcard. They need to have station touch ons, have the time start at the time of when the next train is due to depart from that station. Because as everyone else here has already stated, people will wait until the train just arrives to ‘touch on’. I have no doubt that such a price increase shall see a drop in patronage. Then again, with the recent fuel price of $1.70, who knows. I love how they are making such changes in the start of an Election year. Oh, the Election is not until late 2014? ++ Have hourly increments from 2 hours up to say 4 hours. ++ A short or single trip fare too. Perhaps they should drop the 2 hour thing, and go for 30 minute increments. ++Last week I had two trips to Geelong and back, as I had reached the daily cap on the first trip, my second trip was for free. ++One week before, Did one trip to Geelong, my second trip was to Ballan, being in zone 4. Again, that second trip is free because I had reached my daily cap for zone 4, by going to Geelong. As an inner-city resident it would be nice to see point-to-point fares for shorter trips (capped at the relative zone price) to make PT more affordable. Point-to-point fares are already in place on the V-Line network, so there is no reason why this cannot be extended to metropolitan trains. @Tim, can you send me a screen dump of transactions? I’d be interested in seeing these overcharges. On another note – I got a cabcharge from work to get home from our xmas party and it was a single use contactless NFC paper cabcharge. So it could be a perfect single use ticket for Myki – they could sell day passes at local shops. You are spot on Daniel. If demand falls, so will revenue. It is counter-productive. I am interested in your comment about the potential removal of early-bird. You state: “it could have a big effect on peak hour train demand”. Are you aware of any study which showed how successful it was when introduced in shifting (some) peak demand to pre-peak? thanks. So if V-Line can run 13 zones then it stands to reason that the metropolitan network could be broken down into more than two zones. The current arrangement is oversimplified and does not provide good value for passengers traveling short distances. Aaron, the 13 zones for V/line are the same Myky system as what Metro use. I do agree that there needs to be something for a short distance traveller. Why is the weekend cap only on travel in Zone 1 & 2? Why can’t country people also have a weekend cap for travel between two zones? I agree with a lot of what was said. I understood the rationale from moving from 3-hour to 2 hour tickets in the 90s is that in the end most people got almost 4 hours out of it because of the rounded up time stamps. However, moving to a system that was able to record exact times, it’s probably reasonable to make it exact, but I believe it should go back to 3 hour exact, not a stingy 2 hours. Given the size of our rail system and the length of time journeys take, it is effectively forcing most people to buy daily tickets. Perhaps they are trying to incentivise myki-pass because it means there will be less crowding and enforcement of touch offs required? A particular problem arises with the tram route 5/64 shuttle service at night. 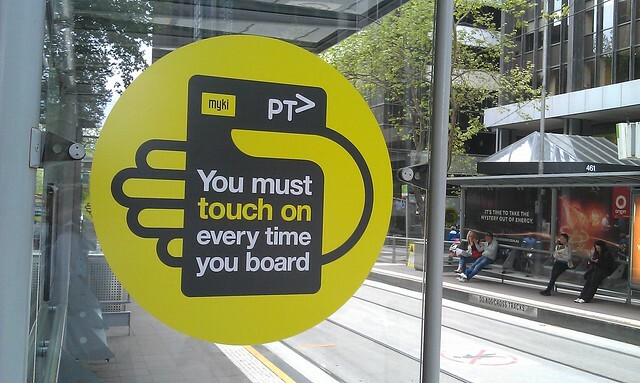 I have unsuccessfully tried to get an answer from Yarra Trams about whether a person is required to touch on a 2nd time when they switch to the 5 at wattletree road. It is not the passenger’s fault that a through service is not offered. Say if the touch on on the 64 at Melbourne University terminus was within the validity of a 2 hour ticket that had been started on a previous journey, but then the 2nd touch on on the 5 at Wattletree Road happens into the 3rd hour, the price of another ticket would be charged, even though for the broken journey was purely caused by the operational reasons of the operator. I believe this is particularly unfair. Yarra Trams claims that the route 5 shuttle service is currently under review by them and PTV, however I have seen nothing public about this; as usual a review does not involve any public consultation, in breach of international best practice for such things. I should mention that the same issue could arise in the case of a faulty tram, or a short terminating tram, where passengers are directed to disembark and wait for the next tram. In London, where this happens on a (flat fare) bus that terminates short or goes out of service, the driver is required to give any passenger who requests it a paper voucher stating exempting them from having to pay again. I’d be interested to hear if anyone has had success claiming a refund from the myki call centre in such circumstances. Myki is the death of public transport. I have been traveling on pt since the age of 5 and it has never been as bad as it is now! I am sick of the government reaching in and taking what doesn’t belong to them. The extra $ should be spent on improving the system! Why do they keep taking from the poor. If you travel on pt you generally are not overly wealthy! Tax the stupid people as Eddie would say! An extra $2.50 per person on the weekend! How is this justified? If I’m traveling shoved in a bus with a wheelchair, 3 prams including my own and four grannies with buggies! It is traumatic traveling on overcrowded vehicles yet the drivers keep letting them in! And when your traveling with a young baby! I will get a seat for my bike as soon as she can hold her head up! Bugger pt! Bike riders will increase! So enjoy, more cars, more bikes more deaths. And the bloods on your hands…. Hope the gouging was worth it!